The town has improved greatly in the last twenty years. Many new houses have been built and old ones renovated till they appear new. Real estate has improved in value. There are no unoccupied houses; before a house is vacated there are several applications for it. There are five general stores, viz: Trussell & Samsell, L. A. Adams, Steele & Bro., Joseph A. McCarty and Steele & Dinges, besides, there is the clothing store of John R. Adams and grocery of Edgar Lemley and two millinery stores—Mrs. Luella McCarty’s and Miss Annie Shryock’s—all prospering. The People’s Bank has been organized, property bought and is being remodeled. It will go in operation before the close of the year. Miss Steele went on to add, “Outside the town the ‘Stephens City Milling Company’ flourishes, and the prosperous ‘M. J. Grove Lime Works’ give employment to from fifty to seventy-five hands.” The M. J. Grove Lime Company would continue to operate in Stephens City through most of the twentieth century. The quarrying operation would close down in September of 1988 after being bought out by the Flintkote, and then Genstar Companies. 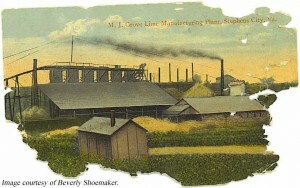 The processing plant was then operated by the Shen-Valley Lime Corporation and would finally close down in 2003. While the future looked bright in 1906 there were more troubled times ahead. In the years between World War I and World War II the Depression troubled the town as it did most communities across the nation. It was during this period that the Peoples Bank of Stephens City failed along with other businesses in town. On 17 November1936 there was a devastating fire that burned a newer section of the town that had grown up around the railway depot called “Stephens City Station,” or “Mudville.” The inferno began in the evaporation building of the Shenandoah Vinegar and Cider Company. Winds caused it to quickly spread, and when it was all over the flames had consumed the company’s evaporator, the cooperage plant, the apple packing shed, a storage house, a corn house, an auto shelter and a store building. The fire also severely damaged a blacksmith shop and workshop, a grocery business and a restaurant. While no one was injured or killed, the property losses were vast, and the owners did not have adequate insurance. The twentieth century also brought changes in the technologies that were used in the homes and businesses of the town. Electrical service was introduced in 1915 before World War I when a line was run from the generator plant on the Shenandoah River to the M. J. Grove Lime Company west of the town. In 1941, just before World War II, a town water system was installed, and a town sewer system was introduced in 1964. Prior to that time those who enjoyed indoor flush toilet plumbing had septic tanks in their yards. Those who did not have indoor plumbing used outhouses in their yards, just as generations had before them. By far, the building of Interstate 81 during the early 1960s affected the town in the twentieth century more profoundly than any other development. A number of significant old homes were torn down to make way for this new freeway, its interchange and the businesses that were later established around it. But for more than two hundred years the road that is now known as U.S. Route 11, and formerly as the old Valley Turnpike or “Great Wagon Road,” had been the artery that carried traffic to all points both northeast and southwest of town. The businesses in town that had catered to the needs of these travelers (if the businesses survived at all) would never be the same after I-81 bypassed the town at its eastern boundary. But just as with the railroad in the late nineteenth century, the new interstate has brought growth to the area. During the last quarter of the twentieth century real estate developers constructed new subdivisions both inside and out of the town boundaries to the east. Increasingly, the interstate helped make Stephens City into a suburban community for commuters who work elsewhere. Anticipating more growth and development, on 1 July 2005 the town annexed 360 acres of land that had formerly been under the jurisdiction of Frederick County. This was followed with another 100 acres on 1 April 2006 and 175 acres on 8 March 2007. This additional land eventually will be developed, the town’s population will grow, and the community will change and expand. As part of this wave of development new housing is currently being built on the same land that Peter Stephens had originally settled on back in 1732. The house he built for himself and his family was lost to time by the mid-nineteenth century. Fortunately, an archeological salvage survey was conducted before the modern building campaign started. Artifacts belonging to the Stephens family period of occupation were discovered and saved. It is hard to know if Peter Stephens, could he see it today, would even recognize this place where he settled back in 1732. The topography has been altered only slightly. With the exception of the quarry where the limestone was mined west of town for most of the twentieth century, the lay of the land across the area has not changed all that much. Buildings cover the landscape, and while the core of the old town retains many historic structures from the eighteenth and nineteenth centuries, the twentieth and twenty-first centuries have made their mark on the areas around the old town. Nevertheless, those who enjoy reading the history of old towns through their architecture will never be disappointed in Stephens City. As growth and development continues to affect the town, the Stone House Foundation will carry on its mission to collect, preserve, and interpret this town’s history.